Classic alla prima canvas from Trevor showing his inimitable style with the brush and layered colours. 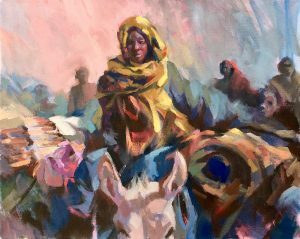 The scene depicts a nomadic woman riding a donkey wearing a yellow shawl. The sunset colouration of the piece invades all the mixtures of paint and produces a harmony across the canvas. There is a mosaic-like quality to the square- brush handling of paint over the finished surface of the painting, which produces a more abstract look to this highly coloured piece. Direct strokes of the brush can be seen clearly indicating confidence with “Bravura” technique and indeterminate patches of colour that intermingle in the viewers eye to create form.